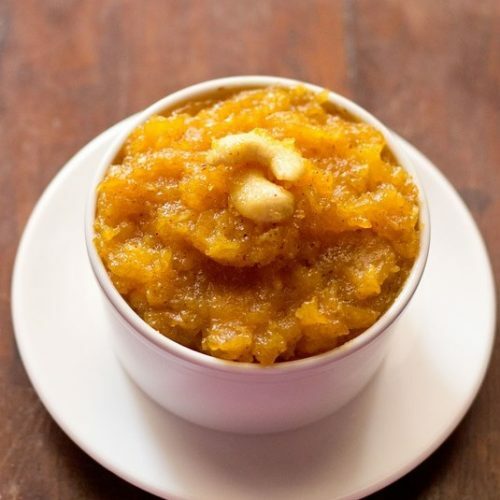 papaya halwa recipe - a vegan indian dessert made with semi ripe papaya. rinse the papaya and slice them. remove the seeds and the pith from the top. peel the slices. then chop the papaya slices, finely. heat oil or ghee in a kadai or pan. add the papaya. stir and cook on a low flame for about 14-15 minutes. keep on stirring on occasions while cooking the papaya. the fruit will release it juices, change color and loose its opacity. add sugar and then stir. continue to cook for further 18-20 minutes on a low flame. by now the oil will begin to separate. add ground almonds and stir. cook for 5 to 6 minutes more till the whole papaya halwa has gotten together and become one whole. add cashews and cook for 1 to 2 minutes more. serve papaya halwa hot or warm. you can also refrigerated and serve the halwa as a cold dessert. one medium papaya yielded approx 2 servings of the halwa. so double the quantity for 3-4 servings. this recipe is not a recipe, but just the method of making halwa. the quantity of ingredients can always be increased or decreased. so the recipe post is just a guideline. if possible use semi ripe papaya. you can also make with ripe papaya. no need to add sugar if making with a really ripe papaya. i have made the papaya halwa with oil, but you can make with ghee if you prefer.